1. Provide environmentally sustainable indoor and outdoor facilities and structure for community activities. 2. Increase participation in heritage activities. 3. Provide opportunities for learning traditional skills through practical participation. 4. Employ, and encourage the use of, natural resources and organic techniques through education, communication of best practices and practical demonstration of uses. 5. Conserve and enhance the historic features of the local landscape, including traditional orchards. 6. 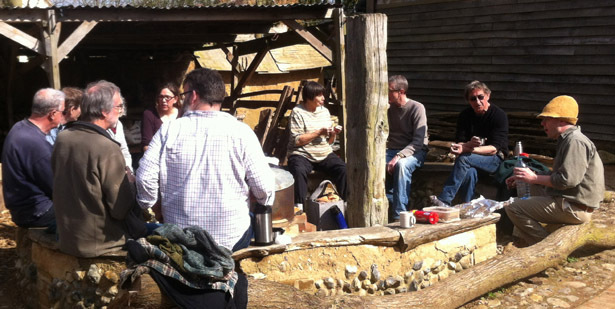 Develop community-supported vegetable plots, orchards, and woodland. 7. Encourage existing wildlife, and aim to increase biodiversity, by improving the habitat of sites within the local community. 8. Provide increased access to, and opportunities for exercise in, green space that is close to the community. 9. Increase, through a holistic educational programme, community awareness and understanding of the effect the individual has on the environment – and the vital interconnectedness between the health of the environment and the health of the individual. Mostly we enjoy meeting outside, but for several months of the year it would be warmer to have a dedicated meeting room in the main barn. Your donation would help this happen. We'd like to run FREE to attend workshops to make and install wattle and daub between the studs, and we'd also like to install a wood burner. Click here to see short video about the appeal and of volunteers working in the woods. Interested in getting involved in Community Workshops? Please email us and we can keep you posted when works starts. Your donation is very much appreciated. 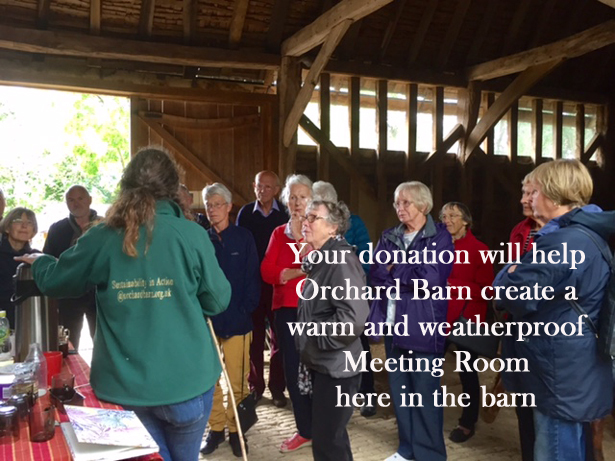 Thank-you from all volunteers and future visitors and students who will enjoy using the warm meeting room at Orchard Barn for years to come.